Today I bought my son a play kitchen. When I was a little girl they only made kitchens in pale pink and purple. Today marketers recognize that lots of women are staying late at the office and just as many men are at home making dinner. I thought, this kid deserves a real kitchen. I also thought it would be an easy purchase. One or two models to choose from – $30 tops. To my dismay, Toys R Us had a SECTION OF THE STORE devoted to gender-neutral “kitchens and housekeeping.” Prices ranged from a $39.99 kitchen on clearance, to kitchens costing more than $300. What will $300 buy you, you ask? A Grand Walk-In Kitchen with faux wood floors, stainless steel appliances, a swivel faucet and a real working telephone. It also guarantees you “a play experience like no other.” Sounded creepy to me. 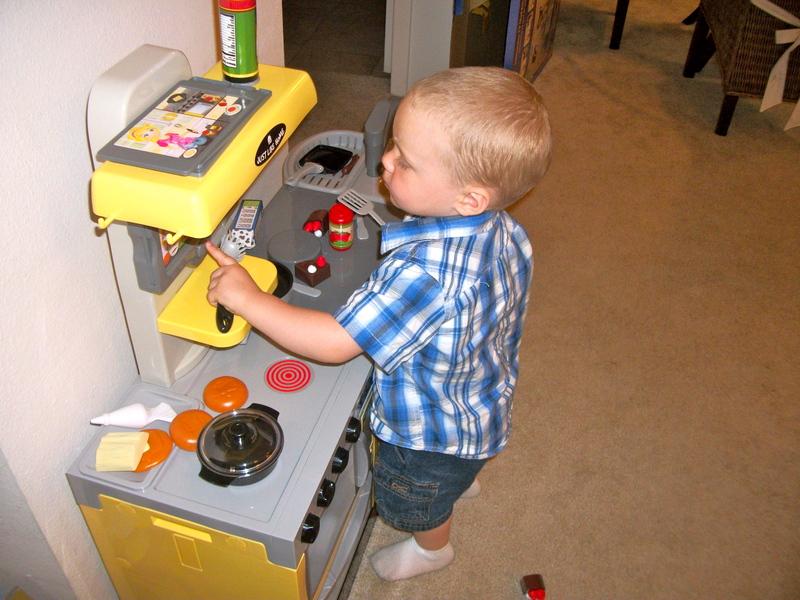 What will these kids have to look forward to when they’ve gotten their first custom kitchen at age 2? 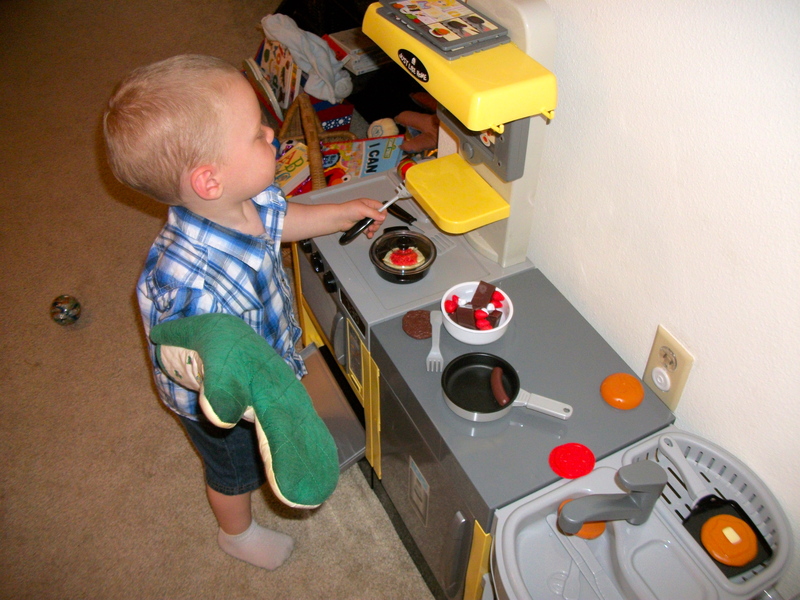 Colt will appreciate his real kitchen some day because he had to play with the clearance kitchen as a child. Rags to riches for him. So I got the kitchen home and opened the box. I poured the 95,000 pieces out on the living room floor and got to work. Todd offered moral support while he watched the baseball game around me. I should have been suspicious of two things from the start: A. The fact that this kitchen was on clearance. B. That it was an “interactive” TV Chef kitchen. What did that even mean? Two hours later, after sweating through my polo shirt putting this b*%$h together, I sat down to give it a whirl. The kitchen featured a TV over the stove. I entered an interactive recipe card, so the Kitchen Siri could guide me through my dish – step by step. Step one, two and three involved gathering the ingredients, mixing them in a bowl and patty-ing the burgers. I followed along cheerfully. Then Kitchen Siri directed me to place a burger patty on the frying pan, and place it on the burner. “Careful, it’s hot,” she warned. (This was after she reminded me to wash my hands because I’d touched raw meat.) Never too early to instill good food safety practices. I placed the small plastic brown disc in the tiny plastic frying pan, and placed it on the burner. “I don’t think that’s quite right,” Kitchen Siri said. “I don’t think that’s quite right,” she repeated. I removed the patty, placed it in the pan again, and readjusted it on the burner. “I don’t think that’s quite right,” she said. She seemed more frustrated this time. I yanked the frying pan off the burner and replaced it with the tiny plastic griddle that also came with the set. Todd walked into the room and found me screaming at the toy kitchen. “I don’t think YOU are quite right!” I yelled at Kitchen Siri. Todd stared at me in disbelief. Colt walked up and moved the frying pan over to the second burner. “Sizzle Sizzle” the kitchen rattled. “Great job!” Kitchen Siri squealed. I looked at my 19-month-old son – proud, and slightly jealous. Kitchen Siri liked him better. But inside it made me feel better to remember that I’d found this toy on clearance. I bet there were many other domestically challenged mommies complaining about Kitchen Siri – and now she was Marked Down. Clearance or not, Colt loved his new toy. And for that, I am grateful to Kitchen Siri…and her ridiculous recipe cards. You are the best story teller. Can’t wait to see y’all this weekend and have Colt cook us a 5 course meal of delicious plastic! Can’t wait to see you guys either! Yeah, you should try Colt’s spaghetti. It’s tasty!